Here’s some more for my character Margie Porter (Aggie’s twin). I’m not really posting these for any other reason other than I needed somewhere to post them so idk. These are my character Agatha Porter from my story. If you’re curious about the story, just ask me or something. So far no one but myself has been reading it (haha). I’ve been on tumblr for years now. Actually, since 2010, if we’re getting technical, so I’ve seen a lot of the phases it’s users goes through. One of which, moodboards, appeared a few years ago. It might have been around longer, and I don’t know who decided they’d be called moodboards, or who even got the idea. I mean, for all we know, Lucrezia Borgia made them, so maybe it’s just recent that they’ve transferred to the computer. What I do know is that I love moodboards. LOVE THEM. They’re great for various reasons. They’re quite nice to look at! If they’re done right, they’re pretty! They help people visualize and articulate their ideas. I know they’re pretty popular for businesses, like designers for instance. With moodboards, you can show the feel you’re going for. They help one express their love of something. Here’s a moodboard I made about Bess Marvin, one of Nancy Drew’s best buds. She’s actually my favorite of characters. I’m currently working on a series of various characters from the Nancy Drew games. Get the template HERE. They are great for character development. For someone who writes once an a while (but really only writes for herself), moodboards are really great for helping me understand my characters. 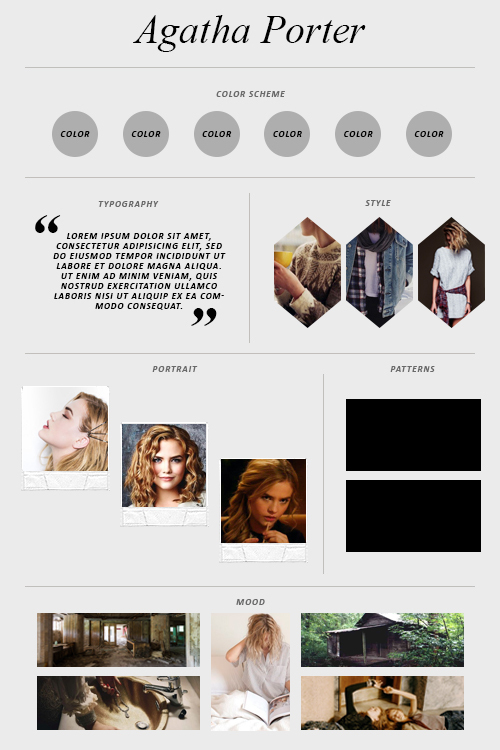 That, Pinterest and Polyvore are all I really need when developing a character. Here’s a moodboard example. This is my character Agatha Porter. I’m still working on it, obviously. I got the template for this moodboard HERE. So how does one go about making a moodboard? There’s a few ways. First you need to decide what kind it’s going to be. Is it going to be physical? Or digital? I don’t really know much about physical moodboards, because the closest I’ve gotten to one outside of having a bulletin board, is a poster collage I made for a project in english class during High School. I’m not even sure what book it was, but I used a lot of pictures from my Nylon magazines. Part of me wishes I hadn’t thrown those out, because I know there was an article about Rory Culkin and I wanted it for my wall. That’s beside the point, though. What I do know about physical moodboards is that they’re great because there are a few things you can do with them that you can’t with digital moodboards. You can feel the items, such as fabric. You can also smell the items, so, say you have a flower pinned to it, or maybe one of those tester strips from the perfume section of Macy’s with One Direction’s Between Us sprayed on it. What does that smell like, by the way? I have yet to smell it. I’m always intrigued by musician’s perfumes. Justin Bieber’s was boring, but Taylor Swift’s tend to smell lovely. Anyway, with a physical moodboard, you can have all that, and then maybe Coach’s Poppy (my personal fave). These I know more about, as you can see from the few moodboards I posted that I made. There are certain elements that go into making a moodboard that you need to think about. What’s the theme you’re going for? If it’s a moodboard to highlight a character, you should think about how this character looks, acts, and thinks. 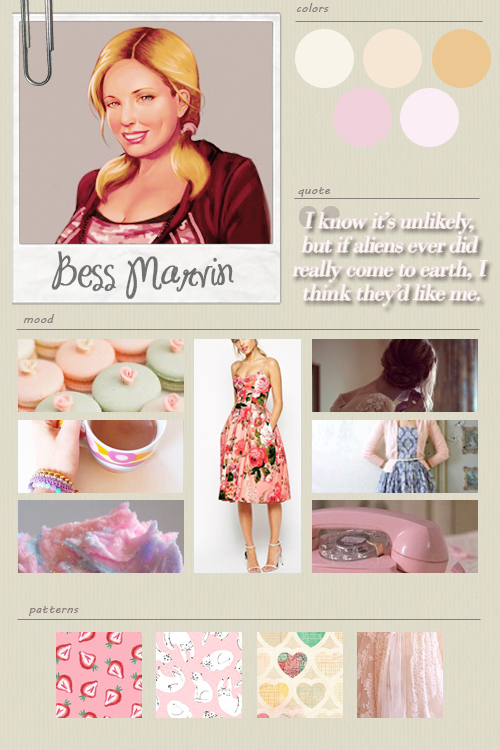 For my Bess Marvin moodboard, I thought a lot about the color pink, cupcakes and Ice Cream, dresses and boys. It’s kinda funny, because that was basically me in a nutshell, so it wasn’t too hard to think like Bess. Color Scheme. This part is one of the hardest parts, I think. I can never decide on what color scheme fits best. Usually I have one color in mind. I also try to keep the pictures similar to the scheme, which is why it should be one of the first things you pick out. I often have trouble deciding what goes best with the one color I have in mind. When this happens, I usually use the internet for help on this. The best site, in my opinion is design-seeds. There are palletes for everything. The only downfall is that it’s a bit tough to find exactly what you’re looking for. Unless you’re really good at mixing colors in their color search mixer, or it fits into the categories they have listed. If not, well…You can either click a category and hope it has what you want, or you can search for it on a search engine. If you do this, remember to add the words design-seeds, or color scheme along with what you want. For example, for Bess’ color scheme I searched pastel doughnut design seed. You would not believe the amount of results I got! Patterns. This part usually takes me a while. First off, you need to either know what you want to use, or have a lot of time and patience. I use two different sites, but for this post I did some searching. The two I use are different Tumblrs, Patternpallette and Patternvomit. Here’s some Pinterest pattern boards: designquixotic’s, oomingmak22’s, lovelyclusters’, corinanika’s, and sharvey’s. You can always search on Pinterest for patterns, or boards with patterns. Typography. This can be tricky for a lot of reasons. My biggest problem is that I still haven’t mastered using font on Photoshop. I mean, I know how to use it, I just can’t get too fancy with it. For this portion, you can do whatever you want. Usually, I do a quote that has to do with the overall theme of the board. So for the Nancy Drew boards, I take a quote from the games that the character has said. I really love the one I used for Bess. Then I scroll through my fonts to find the perfect match. Then I usually use one of the colors from the scheme. Sometimes I make it lighter, or darker, depending on how it looks. Search tumblr for free fonts to download. It’s a treasure-trove of free fonts. Also, Pinterest has boards with freebies for photoshop, so it’s worth a try as well. Optional: Style. If you are not doing a character moodboard, you don’t need the style portion. If you are doing a character, you still don’t need to use the style part, but I like to. That’s one of my favorite portions of the board. For pictures I usually go through Pinterest or Weheartit. The part that puts the Mood in Moodboard. This portion is hard too. Okay, too be honest, the whole thing can be really hard. It can turn out great, or be a disaster. But the most important part of a moodboard is the actual “mood” part. This really sets the tone of the board. Here you can put almost anything you want. More patterns, picture quotes, pictures, whatever. I usually try to use a picture of the general location a person is in, or maybe focus on the color scheme colors for pictures that match up to that. Pictures for this part can be found just about anywhere*. Since I’m not the worlds best how-to writer, here’s a great blog post that talks about making moodboards. I found it quite helpful. *NOTE THIS: While you can find pictures just about anyway, you should never claim any of them as your own. Not only this, but the original poster has the right to ask you to not use the picture. I suggest trying to keep tabs on where you get EVERYTHING you use so that if need be, you can post the credit. Will you be making moodboards? Or have you already gotten into them? If so, please tell me! I’d love to see them!